The existence of kidney stones has been recorded since the beginning of civilization and lithotomy for the removal of stones is one of the earliest known surgical procedures. In 1901, a stone was discovered in the pelvis of an ancient Egyptian mummy, and was dated to 4,800 BC. Medical text from ancient Mesopotamia, India, China, Persia, Greece and Rome all mentioned calculous disease. 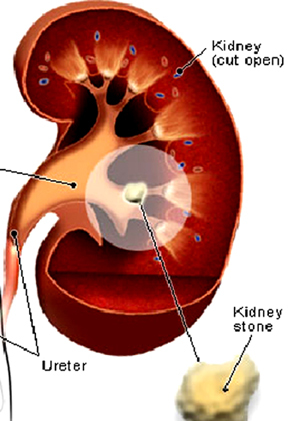 Kidney stones results from stones or renal calculi in the ureter. The stones are solid concretions or calculi (crystal aggregations) formed in the kidneys from dissolved urinary minerals. Nephrolithiasis refers to the condition of having kidney stones. Urolithiasis refers to the condition of having calculi in the urinary tract (which also includes the kidneys), which may form or pass into the urinary bladder. Ureterolithiasis is the condition of having a calculus in the ureter, the tube connecting the kidneys and the bladder. The term bladder stones usually apply to urolithiasis of the bladder. Nephrolithiasis occurs in all parts of the world, with a lower lifetime risk of 2-5% in Asia, 8-15% in the West, and 20% in Saudi Arabia. Men are affected approximately 4 times more often than women. Female patients have a higher incidence of infected hydronephrosis. The prevalence of kidney stones begins to rise when men reach their 40s, and it continues to climb into their 70s. Nephrolithiasis in children is rare. Recent evidence has shown an increase in pediatric cases. One in every 20 people develops a kidney stone at some point in their life. Approximately 80-85% of stones pass spontaneously. Approximately 20% of patients require hospital admission because of unrelenting pain, inability to retain ureteral fluids, proximal urinary tract infection (UTI), or inability to pass the stone. A ureteral stone associated with obstruction and upper UTI is a true urologic emergency. Most calculi arise in the kidney when urine becomes supersaturated with a salt that is capable of forming solid crystals. Symptoms arise as these calculi become impacted within the ureter as they pass toward the urinary bladder. The formation of the 4 basic chemical types of renal calculi is associated with various underlying etiologies. Stone analysis, together with serum and 24-hour urine metabolic evaluation, can identify an etiology in more than 95% of patients. Kidney stones form when there is a decrease in urine volume and/or an excess of stone-forming substances in the urine. The most common type of kidney stone contains calcium in combination with either oxalate or phosphate. Other chemical compounds that can form stones in the urinary tract include uric acid and the amino acid cystine. · Dehydration from reduced fluid intake or strenuous exercise without adequate fluid replacement increases the risk of kidney stones. Obstruction to the flow of urine can also lead to stone formation. Kidney stones can also result from infection in the urinary tract; these are known as struvite or infection stones. · People who have already had more than one kidney stone are prone to develop more stones. A family history of kidney stones is also a risk factor for developing kidney stones. · There has been some evidence that water fluoridation may increase the risk of kidney stone formation. In one study, patients with symptoms of skeletal fluorosis were 4.6 times as likely to develop kidney stones. However, fluoride may also be an inhibitor of urinary stone formation. · A number of medical conditions can lead to an increased risk for developing kidney stones: e.g. Gout can lead to the formation of uric acid stones. Hypercalciuria causes stones in more than half of cases. · Other conditions associated with an increased risk of kidney stones include hyperparathyroidism, metabolic kidney diseases such as renal tubular acidosis, medullary sponge kidney, and some inherited metabolic conditions including cystinuria and hyperoxaluria. Chronic diseases such as diabetes and hypertension; people with inflammatory bowel disease or who have had an intestinal bypass or ostomy surgery are also more likely to develop kidney stones. While some kidney stones may not produce symptoms (known as “silent” stones), people who have kidney stones often report the sudden onset of excruciating, cramping pain in their low back and/or side, groin, or abdomen. Changes in body position do not relieve this pain. The pain typically waxes and wanes in severity, characteristic of colicky pain. The signs and symptoms whichever develops in kidney stones are mainly due to obstruction in urinary tract caused by the stone. Most calculi originate within the kidney and proceed distally, creating various degrees of urinary obstruction as they become lodged in narrow areas, including the ureteropelvic junction, pelvic brim, and ureterovesical junction. The obstruction by a stone may cause dilation or stretching of the upper ureter and renal pelvis (the part of the kidney where the urine collects before entering the ureter) as well as muscle spasm of the ureter, trying to move the stone. Calculi that have entered the bladder are usually asymptomatic and are passed relatively easily during urination. · Renal colic: The pain is most commonly felt in the flank, lower abdomen and groin. Renal colic can be associated with intense nausea with or without vomiting. · Stones obstructing the ureteropelvic junction may present with mild-to-severe deep flank pain without radiation to the groin, due to distension of the renal capsule. · Stones impacted within the ureter cause abrupt, severe, colicky pain in the flank and ipsilateral lower abdomen with radiation to the testicles or the vulvar area. · Stones lodged at the ureterovesical junction also may cause irritative voiding symptoms, such as urinary frequency and dysuria. · Rarely, a patient reports positional urinary retention (obstruction precipitated by standing, relieved by recumbency), which is due to the ball-valve effect of a large stone located at the bladder outlet. · Colic: The classic patient with renal colic is writhing in pain, pacing about, and unable to lie still, in contrast to a patient with peritoneal irritation, remains motionless to minimize discomfort. Pains are most commonly felt in the flank, lower abdomen and groin with nausea and vomiting. · Tenderness: The most common finding in ureterolithiasis is flank tenderness due to the dilation and spasm of the ureter from transient obstruction as the stone passes from the kidney to the bladder. · Haematuria: There can be blood in the urine, visible with the naked eye or under the microscope (macroscopic or microscopic haematuria) due to damage to the lining of the urinary tract. · Oliguria: Reduced urinary volume caused by obstruction of the bladder or urethra by stone. · Fever: It is not part of the presentation of uncomplicated nephrolithiasis. If present, suspect infected hydronephrosis, pyonephrosis, or perinephric abscess. · Abdominal examination: Usually is unremarkable. Bowel sounds may be hypoactive, a reflection of mild ileus, which is not uncommon in patients with severe, acute pain. · Testicles may be painful but should not be very tender and should appear normal. · Older patients: In patients older than 60 years with no prior history of renal stones, the physician should look carefully for physical signs of Abdominal Aortic Aneurism. CT scan: A helical CT scan without contrast material is considered the gold-standard diagnostic test for the detection of kidney stones or obstruction within the urinary tract and almost all stones are detectable by CT scan. This gives a clearer idea of the exact size and shape of the stone as well as its surgical orientation. X-rays: The relatively dense calcium renders these stones radio-opaque (90% cases) and they can be detected by a traditional X-ray of the abdomen that includes the Kidneys, Ureters and Bladder. About 10% of stones do not have enough calcium to be seen on standard x-rays (radiolucent stones). Intravenous Pyelogram (IVP) or IntraVenous Urogram (IVU): The test requires about 50 ml of a special dye to be injected into the bloodstream that is excreted by the kidneys and by its density helps outline any stone on a repeated X-ray. Retrograde pyelogram: The stones can also be detected by a retrograde pyelogram where similar “dye” is injected directly into the urethral opening in the bladder by a surgeon, usually an urologist. Ultrasound: It is useful to detect stones in a pregnant woman where x-ray exposure or CT scan is usually avoided. Urine examination: Microscopic study of urine, which may show proteins, red blood cells, bacteria, cellular casts and crystals. 24 hour urine collection to measure total daily urinary volume, magnesium, sodium, uric acid, calcium, citrate, oxalate and phosphate. Blood tests: Full blood count for the presence of a raised white cell count (Neutrophilia) suggestive of infection, a check of renal function and to look for abnormally high blood calcium blood levels (hypercalcaemia). About 90% of stones 4 mm or less in size usually will pass spontaneously; however 9% of stones larger than 6 mm or a staghorn impacted stone will require some form of intervention. There are various measures that can be used to encourage the passage of a stone. These can include increased hydration, medication for treating infection and reducing pain, and to encourage urine flow and prevent further stone formation. Caution should be exercised in eating certain foods, such as star fruit, with high concentrations of oxalate which may precipitate acute renal failure in patients with chronic renal disease. Preventive strategies include dietary modifications reducing excretory load on the kidneys. In most cases, a smaller stone that is not symptomatic is often given up to four weeks to move or pass before consideration is given to any surgical intervention as it has been found that waiting longer tends to lead to additional complications. Immediate treatment and even surgical intervention may be required in certain situations such as in people with only one working kidney, bilateral obstructing stones, and intractable pain or in the presence of an infected kidney blocked by a stone which can cause sepsis where the life of the patient is at risk. Water intake: Drinking enough water to make 2 to 2.5 liters of urine per day. Beverages: Avoidance of cola beverages. Vitamin: Avoiding large doses of vitamin C.
Intake of calcium: Calcium plays a vital role in body chemistry so limiting calcium may be unhealthy. Since calcium in the intestinal tract will bind with available oxalate, thereby preventing its absorption into the blood stream, some nephrologists and urologists recommend chewing calcium tablets during meals containing oxalate foods. Oxalate food: Restriction of oxalate-rich foods, such as chocolate, nuts, soybeans, rhubarb and spinach, plus maintenance of an adequate intake of dietary calcium. Decreased protein diet: A diet low in protein, nitrogen and sodium intake is usually advised. Fruit juice: Some fruit juices, such as orange, blackcurrant, and cranberry, may be useful for lowering the risk factors for specific types of stones. Orange juice may help prevent calcium oxalate stone formation, black currant may help prevent uric acid stones, and cranberry may help with UTI-caused stones. Homoeopathic medicines have great role in the treatment of renal stone and to prevent its recurrence. Besides treating the cases with homoeopathic potency, I have also prescribed some mother tinctures as per the indications in the case. Application of mother tincture in such cases greatly relieves the pains and helps in easy expulsion of the stone from urinary tract. In Homoeopathic Materia Medica we have a considerable number of medicines which are very useful in such cases of kidney stones. The anti-miasmatic constitutional treatment in a case of kidney stone prevents the recurrent tendency of the stone and provides the patient a pain free normal life. Kidney stones typically leave the body by passage in the urine stream, and many stones are formed and passed without causing symptoms. If stones grow to sufficient size before passage on the order of at least 2-3 millimeters they can cause obstruction of the ureter. The resulting obstruction causes dilation or stretching of the upper ureter and renal pelvis as well as muscle spasm of the ureter, trying to move the stone. Sometimes, symptoms such as difficulty in urinating, urinary urgency, penile pain, or testicular pain may occur due to kidney stones. Surgical techniques have also been developed to remove kidney stones when other treatment methods are not effective especially in cases of larger stone or impacted staghorn stones. In most of the cases the above mentioned homoeopathic medicines are successfully used to relieve pain, to drain out the stones and preventing the recurrence. 1. Allen, H. C.: Keynote Materia Medica; B. Jain Publishers (P) Ltd.; New Delhi; Reprint Edition; 1998. 2. Bailey & Love: Short Practice of Surgery; Arnold Publication, London; 24th Edition; 2004. 3. Boericke, W.: Homoeopathic Materia Medica and Repertory; B. Jain Publishers (P) Ltd.; New Delhi; Reprint Edition; 1998. 4. Das, S.: A Concise Text Book of Surgery, Dr. Das Publication; Kolkata; 3rd Edition; 2001. 5. Hering, C.: The Guiding symptoms of our Materia Medica; B. Jain Publishers (P) Ltd.; New Delhi; Reprint Edition; 2000. 6. Hughes, R.: The Principles and Practice of Homoeopathy; B. Jain Publishers (P) Ltd.; New Delhi; Reprint Edition; 1994. 7. Kent, J. T.: Repertory of the Homoeopathic Materia Medica; B. Jain Publishers (P) Ltd.; New Delhi; Reprint Edition; 1999. 8. Schroyens, Fr. : Synthesis Repertory; B. Jain Publishers (P) Ltd.; New Delhi; 8.1 Edition; 2002.